The Cantabrian Coastal Way, Ruta do Cantábrico, is our newest coastal trail running along 131kms of superb coastline in the North of Galicia, from the charming historic town of Ribadeo to the fishing village of O Barqueiro. At every turn along your Ruta del Cantábrico adventure you will be spoiled with beautiful panoramic coastal views out over the sweeping Cantabrian Sea. 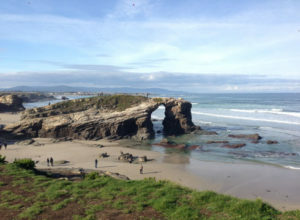 Along the way you will stay in lively seaside towns and villages such as Ribadeo, Foz, San Cibrao, Viveiro and O Vicedo, and enjoy all the beaches in Lugo province, among them the famed Catedrales beach. Discover the unique relationship locals have with the sea. Enjoy the rías, some of which have been declared Protected Natural Spaces; treat yourself to some of the best seafood and fresh fish; and be amazed by the unmissable Catedrales beach, one of the most spectacular coastal sights in the country. You can walk or cycle along the Ruta del Cantábrico which is suitable on the most part for bicycles, however you should bear in mind that small sections of the route at times run along small public roads. 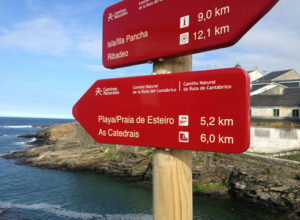 This stage of the Cantabrian Sea Nature Trail starts at the port of Ribadeo, and continues along the coastline, where the traveller can enjoy the view of breathtaking cliffs and beaches and observe the close relationship of the locals with the sea. Along your route today you will pass by Las Catedrales beach, which translates as beach of the Cathedrals and was declared a Natural Monument due to the astounding beauty of its rocky sculptures carved by the sea. Continue along the coast passing along by many more spectacular smaller beaches before reaching the town of Barreiros, your resting place for the night. Easy Walking Option: You can bhoose to shorten your walking/cycling day today with an overnight stay in Rinlo. The trail continues, leaving behind many charming beaches until it reaches the mouth of the Masma river, which forms the Foz-Masma ría, which has been included on the Natural 2000 Network as a Site of Community Importance (SCI) and a Special Protection Areas for Wild Birds (SPAB). Finally, this stage ends at the pretty town of Foz, which boasts a long fishing tradition. Enjoy a lovely meal and rest this evening. The trail leaves Burela by the O Portelo beach, allowing the traveller to enjoy the Ril beach and the A Marosa beach by walking along the seafront promenade that runs along the cliffs. 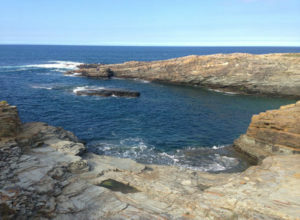 After the Rueta beach, the trail leaves the coastline so you can admire the impressive Pazo de Pedrosa and shortly afterwards it arrives to the spectacular village of San Cibrao, where, after walking its peninsula and the Punta Atalaya lighthouse, this stage ends in front of the old fish salting factory and the Don Julián sawmill. Leave San Cibrao by the Lierio ría crossing the O Bao medieval bridge over the Covo river. 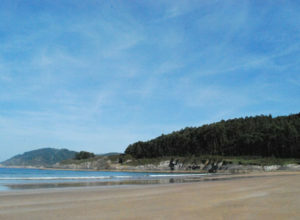 Reach the Lago beach and the Portiño de Morás. The trail follows the limits of the SCI and SPAB of Costa da Mariña Occidental. The ruins of San Tirso Monastery stand before many beaches, and passes by Celeiro beach before reaching Viveiro where you will stay tonight. 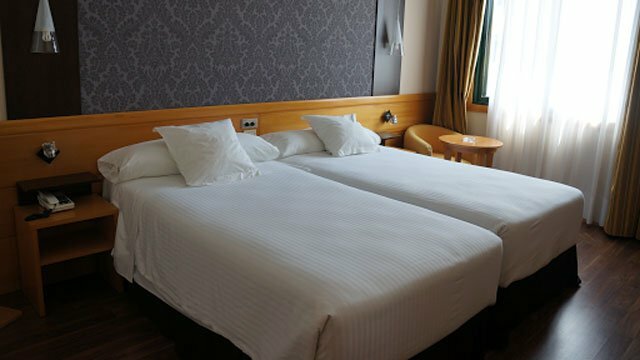 Easy Walking Option: Shorten your walk today with an overnight in the small coastal community of Faro between San Cibrao and Viveiro. 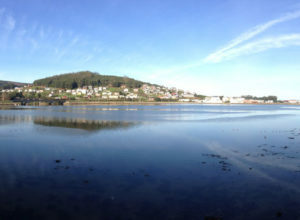 The Misericordia Bridge crosses the Viveiro ría, leaving the old town behind. Between the beaches of Covas and Abrela, you have the option to visit the O Cargadoiro ethnographic site. The San Román Calvary, in the beach of the same name, is testament of the roughness of the sea. Finally, the trail reaches O Vicedo, which is a spectacular ending to the lovely Ruta del Cantábrico. Continue along over the bridge leaving the province of Lugo arriving into the town of O Barqueiro in the province of Coruna. Easy Walking Option: Shorten your walk/cycle today and stay overnight in the tranquil community of San Román de Vale, located between the towns of Viveiro and O Barqueiro. 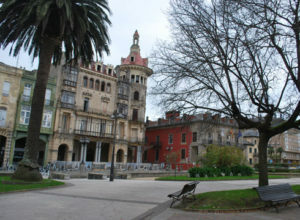 A Coruna Airport 152km: Take the bus from the Airport to the centre of A Coruna (every 15 minutes, taking 13 minutes). From there take the bus to Ribadeo (twice daily, taking 2h15mins. Santiago de Compostela Airport 163km: Take the bus from the airport to Lugo (every hour, taking 1h48mins) and from there take the bus to Ribadeo (once daily, taking 1h30mins). OR. Take the bus from the airport to Santiago de Compostela (every 15 minutes, taking 19 minutes) and from there take the bus to Ribadeo (twice daily, 3h15mins). 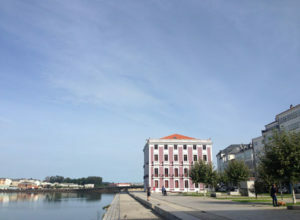 A Coruna Airport 108km: Take the train from O Barqueiro to Ortigueira (4 times a day, taking 22 minutes) and then take the bus to A Coruna city centre (twice daily, taking 2h25mins). From there take the bus to A Coruna Airport (every 15 minutes, taking 14 mins). Santiago de Compostela Airport 149km: Take the train from O Barqueiro to Ferrol (4 times a day, taking 1h40mins) and then take the bus to Santiago de Compostela (5 times a day, taking 1h20mins). From there take the bus to the airport (every 15 minutes, taking 19 minutes). Asturias Airport 169km: Take the train from O Barqueiro to Muros de Nalon (twice daily, taking 4h26mins) and from there take a taxi to Asturias Airport (12km).